Does Mueller have enough on Trump?…And would THAT mean anything? 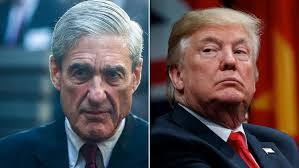 There is NO law against Robert Mueller & Co. indicting President Donald J. Trump for crimes committed…. The popular feeling among the Washington politicians is that such an heavy lift should be done by charges brought up in the US House and a vote in the US Senate to remove a President from office…. Even if a Federal Grand Jury was to pass up criminal charges against Donald Trump? It would be doubtful that the Justice Department would proceed with those charges…. With-a Majority Republican US Senate? We COULD have a situation where a US President has had summarily criminal charges handed up against him and he continues to remain in office and possibly run for a second term…. Such is the reverence lawmakers may end up using as an excuse to protect the “office of the Presidency’? “For nearly two years, since the U.S. intelligence community released its report on the Russian campaign to assist Donald Trump in the 2016 election, the American people have been seeking an answer as to whether the Trump campaign colluded with its Russian counterpart. In the endless speculation about the direction of the investigation, a common view was that maybe the investigation would never implicate President Trump or find any collusion,” the Daily Beast reports. Interesting Update on Mueller’s trove of evidence….